Arrow keys to move Adorninho (faster) or Click and Drag with the mouse. P to pause the game. The main objective of the game is to save Adorninho from the giant wave, by crossing the mazes and reaching the safe place. 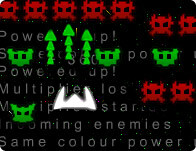 But there are checkpoints and powerups that may help you to achieve a higher score in the Top Ranking.